The complex issue of net neutrality is not likely to be dinner conversation for many in the U.S. Still, the Federal Communications Commission vote expected today could dramatically impact the flow of digital content Americans receive, not to mention the bottom line for many major U.S. technology and content companies. So, where could the public find news about this issue? A new analysis of media attention to the topic from January 1 – May 12, 2014 finds coverage in national television news all but absent, and sparse in most major newspapers. Instead, during key developments, interested members of the public turned to Twitter and online searches to learn more or share their own insights. Net neutrality is the principle that all digital information should be treated equally by companies that provide the cables and networks that make up the Internet. The FCC is expected to vote today on whether to propose new rules announced last month by Chairman Tom Wheeler that included a “fast track” provision which would allow Internet Service Providers (ISPs) to charge companies fees for faster access to the ISP’s customers. The decision could impact the speed and quality of different kinds of digital content (such as video and music) that consumers receive. It could also dramatically affect the economics and balance of power of technology and content companies – so much so that 150 technology companies, including Google, Amazon and Twitter, signed on to a letter that strongly opposed the new rules. In order to determine how much the general public was being exposed to the issue in the mainstream media, Pew Research Center examined news coverage in 23 of the largest circulation daily newspapers and on major broadcast and cable television networks. We also analyzed Google search data using Google Trends and Twitter posts to compare news coverage with how much the topic was being searched for and discussed on social media. The period studied began shortly before a January 14, when the D.C. Circuit Court ruled that the FCC overstepped its legal authority by attempting to enforce net neutrality. Our period of analysis ended just before the FCC vote expected this week. So far in 2014, coverage of net neutrality has been all but absent from network and cable news coverage. 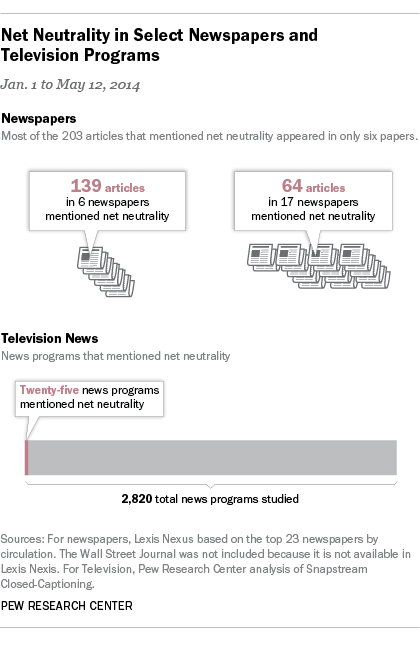 An analysis of 2,820 news programs from January 1, 2014 through May 12 across eight different network and cable news channels found just 25 programs mentioned the term net neutrality. What’s more, six of those programs, the most of any channel, were on Al Jazeera America, a new channel that is not available in many American households. On, CNN, the second-largest cable news network, we found just a single program mentioned net neutrality in the 658 programs on CNN studied since January. neutrality issue found a forum on Twitter—and virtually all of the commentary expressed support for the concept. announcement of its new rules on April 23 and the following two days. An examination of the comments shows near unanimous support for net neutrality. In fact, researchers were unable to even find enough tweets in opposition of net neutrality to run the kind of computer analysis on tone that Pew Research has done for other issues. 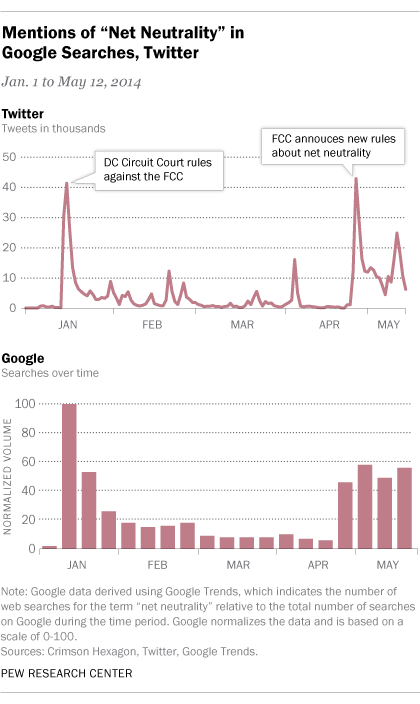 Similarly, in Google, searches for the term net neutrality spiked during the two major net neutrality decisions. According to Google Trends, searches for “net neutrality” increased dramatically during the week of January 12-18 when the district court ruled against the FCC. They rose again the week of April 27-May 3rd after the FCC announced its new rules and the technology companies came out against it. In the interim periods, the searches dropped off as the news events died down. Even with the spikes in social and search activity the segment of the population following the issue is relatively small. Still, a comparison to the debate over the Keystone Pipeline speaks to the distinction in this case between mainstream media and digital activity. The overall number of tweets during the 17 weeks studied was similar to the volume of tweets containing the term Keystone Pipeline (757,916). And the number of searches were similar as well for both topics. National television, however, devoted far more attention to Keystone than to net neutrality: 340 programs mentioned Keystone Pipeline during the time period studied, compared with the 25 that mentioned net neutrality. The methodology for this report can be found here.